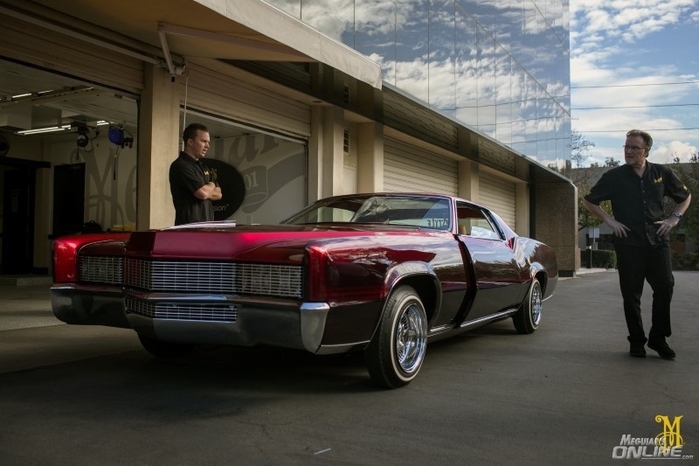 We recently were privileged with the opportunity to work on a one of a kind Lowrider owned by Joe Ray, editor at Lowrider Magazine. To quote Joe himself, "Lowriders are all about the paint." This car was no exception! 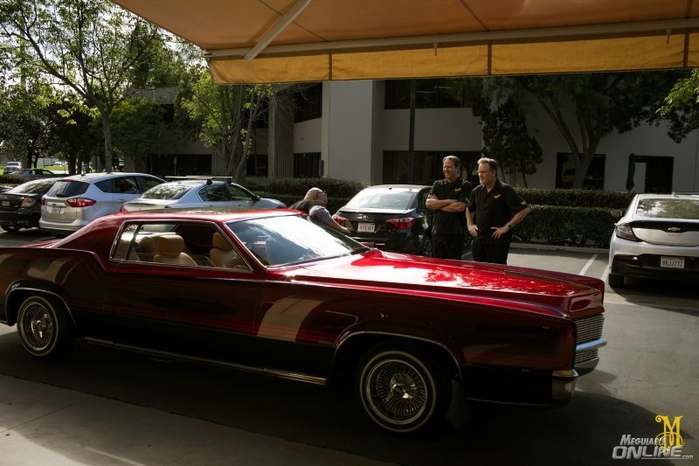 Backstory: We recently caught up with Joe and got a chance to take a look at his 1968 Cadillac Eldorado. Joe mentioned there was some orange peel texture in the paint he was planning on working on soon. We responded with, "We can help you with that if you'd like : )." 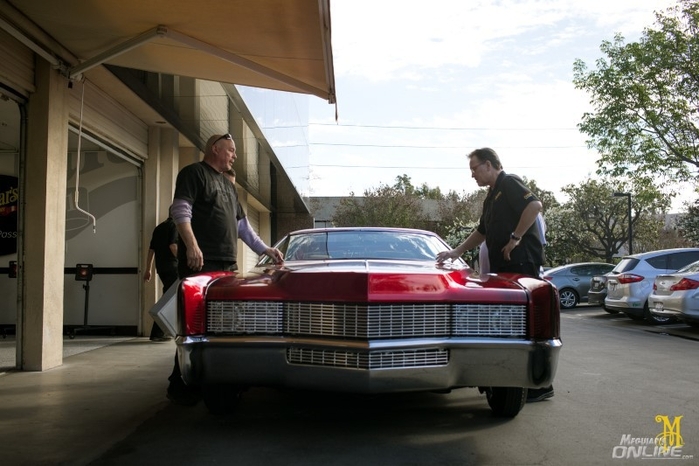 Joe agreed and last month myself, Mike Stoops, and Mike Pennington teamed up to detail Joe's ride. 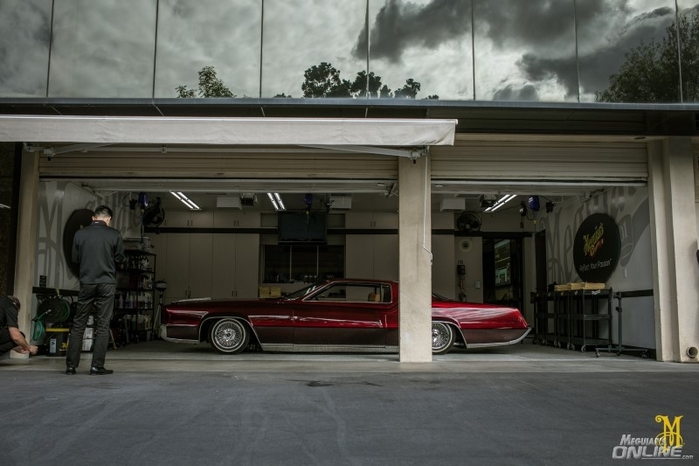 Joe's Eldorado has been getting built over the past couple years, and is now getting close to complete. 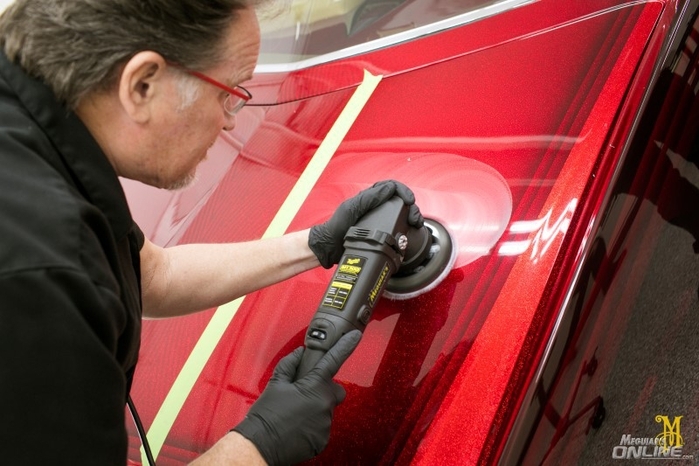 The car was painted about 2 years ago, and shortly after it was painted, it was "cut & buffed", where the paint shop technicians use specialized automotive paint sanding techniques in an effort to flatten out any texture in the paint. Compound is then used to remove the sanding marks, & a finishing polish step is then used to remove any remaining defects & further refine the paint, all in an effort to produce a mirror like finish with a super high gloss. Fast forward many months after that initial "cut & buff" was complete, after the paint cured, the hood & the trunk lid "shrunk." More texture & orange peel developed as a result of the paint on these areas "shrinking" from the curing process (fairly common). This is what Joe was planning on working on himself, and this is what we were going to help him with. Our Goal: Knock down the texture in these areas by using specialized hand & machine sanding techniques, also known as "Wet Sanding or Color Sanding", then remove those sanding marks with a compound, remove any other defects present, then machine polish the entire car to bring out a ultra high gloss finish, and finally lock all of that work in with a coat of wax. This article will describe the products & processes we used. 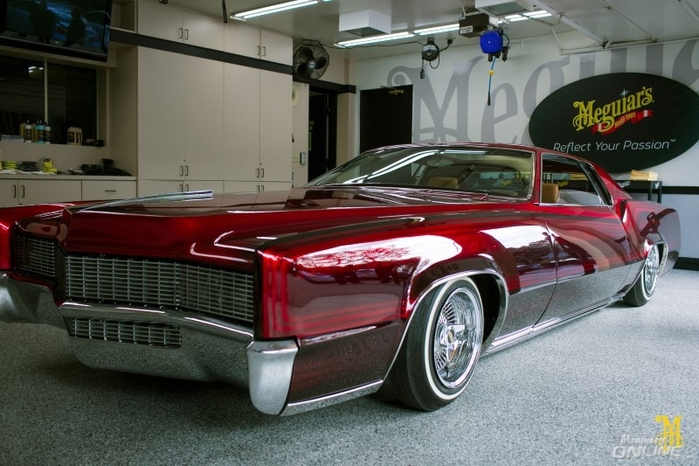 February 14th, 2018 - Lowrider Magazine's office is literally right down the street from Meguiar's offices here in Orange County, California. Joe drove the car in to drop it off for us to work on. Appropriate color for Valentines Day we might say! Myself and Mike Stoops had not seen the car in person until the morning it was dropped off. Seconds into seeing the car for the first time, we are already talking game plan. Projects like this are a lot of work and require intense dedication & focus, but they are also super fun. Furthermore, if you get lucky enough to get a paint like this one where everything responds so effortlessly, the fun level goes through the ROOF! This vehicle is LONG! We've got some work ahead of us! Alright, time to get to work. Since the car was mostly clean & did not require a traditional wash, we started by doing a complete wipe down with our Professional Mirror Glaze #M34 Final Inspection & Supreme Shine Microfiber Towels, leaving us with a completely clean paint surface to work on. Side note, this was not the only time we wiped the car down throughout the process, in fact, we frequently wipe down the car throughout the day. For example, if a panel is about to be sanded or compounded, and was wiped down 3 hours prior, is there a possibility some dust could has accumulated on that panel? Absolutely. That dust can potentially interfere with our sanding or compound/polish step, at the worst, potentially even scratch the paint. Lesson here, when working on a project, when in doubt, wipe the panel with a detail spray, in this case our #34 Final Inspection, to ensure no loose dust is on the panel, prior to working on that panel. Mike Stoops using our #34 Final Inspection to remove all light dust from the vehicle. There was some dried compound & polish residue in many of the cracks in crevices. We wanted to address & remove this residue first so we did not have to deal with it later when we were done. We flushed the residue out with some D110 Hyper Wash mixed up in a spray bottle, along with a very soft bristled brush. And the TEXTURE. Now this is not the easiest defect to capture in a picture. Concentrate on the reflection of the fluorescent lights in our garage. The reflection is blurred and it looks like the peel of an orange, hence, the term "orange peel." Here are a couple shots of the trunk, again focus on the reflection of the overhead florescent lights. By removing some of this texture we will be able to achieve a much more dramatic reflection & overall appearance of this one off custom paint. To start, many would reach straight for the sand paper. We ultimately knew that was going to be needed. 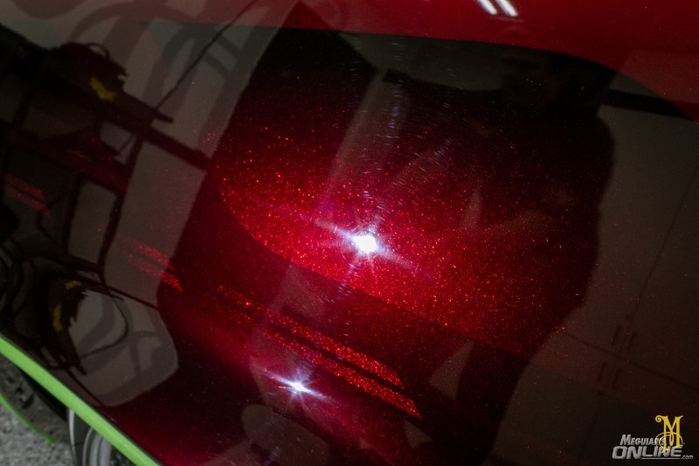 To get an understanding of how the paint was going to respond, we started with Meguiar's Professional Mirror Glaze M100 Pro Speed Compound via DMC5 5" DA Microfiber Cutting Disc, on MT300 Dual Action Polisher. Would M100 knock any of the texture down? Would it develop a crazy DA Haze? It is these types of questions that performing this step will answer, thus giving us a better understanding of how the paint would respond for the entire project. The result, this combination did not touch the texture, but also did not develop an abundance of DA Haze. Video: Mike Stoops performing the initial test spot with M100 Pro Speed Compound/DMC5/MT300. Next we moved to testing Meguiar's S6F3000 6" Unigrit 3000 grit Foam Finishing Disc backed with S6FI 6' Foam Interface Pad via 6" pneumatic air sander, in attempt to see if this combination would knock down any texture. Result: If you look closely, you can see that there is texture still evident after sanding with 3000 grit by machine. This is normal and expected. Time to move up in aggressiveness. 1500 grit sanding disc backed with Meguiar's Professional S6FI Unigrit 6" Foam Interface Pad via 6" pneumatic D/A Sander. The above two setups removed the same amount of texture. We used one or the other depending on area. Both of these set ups were followed with Meguiar's S6F3000 Professional Mirror Glaze Unigrit 3000 6" Foam Finishing Disc, backed with Meguiar's Professional S6FI Unigrit 6" Foam Interface Pad via 6" pneumatic D/A Sander. Video: Mike Stoops performing a section pass with 1500 grit sanding disc backed with Meguiar's Professional S6FI Unigrit 6" Foam Interface Pad via 6" pneumatic D/A Sander. 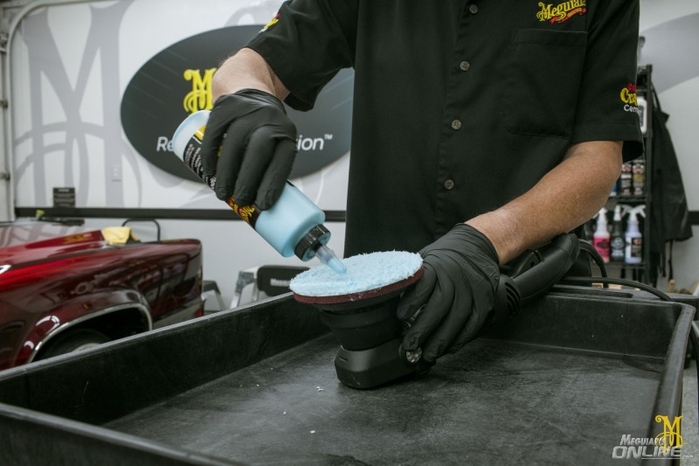 Pictured below: After either above hand sanding or machine sanding set up, then Meguiar's S6F3000 Professional Mirror Glaze Unigrit 3000 Grit 6" Foam Finishing Disc, backed with Meguiar's Professional S6FI Unigrit 6" Foam Interface Pad via 6" pneumatic D/A Sander. 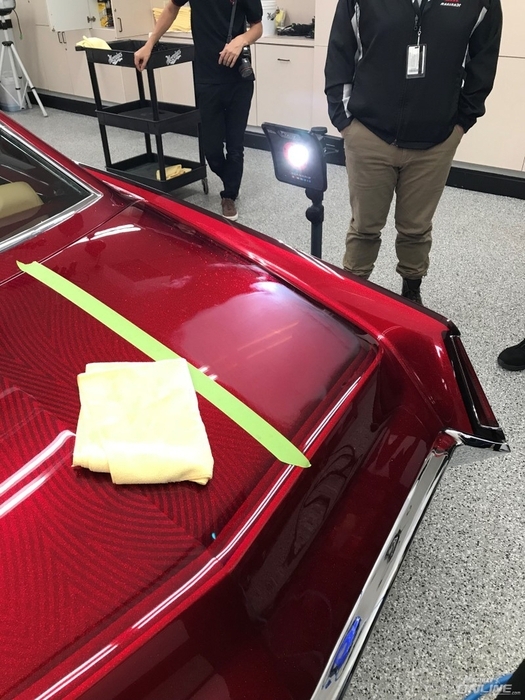 Hood & Trunk Lid process after sanding: After the sanding was completed, we tested various options and ended up using Meguiar's Professional Mirror Glaze M100 Pro Speed Compound on our WRWHC7 Soft Buff Rotary Wool Heavy Cutting Pad via Rotary Polisher machine. Next was Meguiar's Professional Mirror Glaze M205 Ultra Finishing Polish on our DFP5 5" Soft Buff DA Foam Polishing Disc via MT300 Dual Action Polisher. The sides & the rest of the vehicle had random isolated defects as well as light swirls/scratches. For the random scratches & defects, we used M100 Pro Speed Compound with either DMC3 or DMC5 DA Microfiber Cutting Disc on MT300 Dual Action Polisher. Below we address some left over sanding marks from the initial "cut & buff." DURING w/ M100 Pro Speed Compound/DMC3 DA Microfiber Cutting Disc (3inch) on MT300 Dual Action Polisher w/ DBP3 Soft Buff 3" DA Backing Plate. And AFTER the above compound step. Still needs to be polished but VERY little haze after such an aggressive step. So nice! A combination of various machines were used throughout the project: Electric Rotary Polishers, Electric Dual Action Polishers, pneumatic rotary machines, pneumatic dual action polishers, 3" microfiber discs, 4 inch foam pads, 5 inch foam & microfiber discs, 7 inch rotary wool pads, etc. 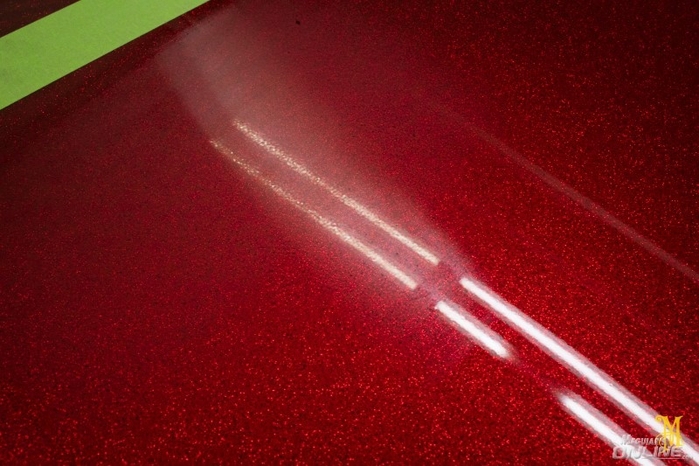 Further refine the paint producing a ultra high gloss. Below example shot after M205 Ultra Finishing Polish/DFP5/MT300. It's hard to even imagine how one would achieve these effects in this custom paint. So fun! Finally it was time to apply a coat of wax and for this we chose Meguiar's most premium full synthetic sealant, Ultimate Wax. We opted for the paste version on this car applied with our G3509 4" DA Power Waxing Pads via MT300 & DBP3 3" Backing Plate. We also applied the wax by hand in certain areas with our W0004 Soft Foam Applicator Pads. After allowing the wax to dry for about 15 - 20 minutes it was time for wipe off! Final details are all that is left! Interior vacuum, quick wipe down of interior with our Quik Interior Detailer Cleaner, & Ultimate Waterless Wash & Wax for the door jambs. And finally we get to see all all that work in the sun! The paint seemed to come alive a little bit, check out these below pictures! The gloss is so deep! Paint looks like it's actually wet with water!! Thanks again to Joe Ray & Lowrider Magazine. This was one for the books! Came out great. Nicely done guys. Is there a gold flake layer, in a mix of red/clear just under the top clear coats? Car looks terrific Joe. Hope to see it locally. Wow you guys did a phenomenal job! That particular body style between 67-69 is among my favorite of all Cadillacs. Hats off to you my friends. You are true detailing Masters! You served that car Justice. I couldn't even begin to try to determine the process! Awesome work on a unique car! Great job!